A railgun is an electrically-powered artillery gun. The railgun accelerates a projectile along metal rails using electromagnetic energy. Railguns uses two sliding or rolling contacts that permit a large electric current to pass through the projectile. This current interacts with the strong magnetic fields generated by the rails and this accelerates the projectile. Particular characteristics are the lack of propellant (only the projectile and the electrical energy to launch it are required), and the ability to launch projectiles much faster than firearms-based technology allows. Current technology allows a projectile fired from a rail gun to achieve speeds of around Mach 8 (8 times the speed of sound). Watch the second video below to see the latest declassified video of the test firing of the BAE System Electromagnetic Railgun last Feb 2012. 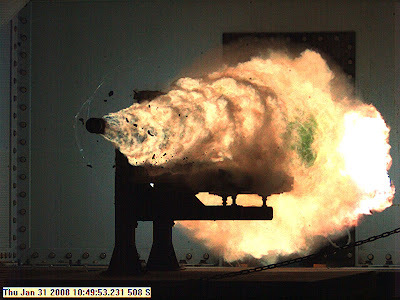 The Office of Naval Research hosted a media teleconference Feb. 28 to announce the Electromagnetic Railgun (EM Railgun) program's new test series following the first full-energy shot on its industry-built prototype launcher. Previously, the Navy used a laboratory railgun system to develop the technology. The new launcher brings advanced material and high-power technologies into a system that now resembles a large-caliber gun. Engineers at Naval Surface Warfare Center Dahlgren Division (NSWCDD) will fire the first full-energy shot on the EM Railgun prototype launcher, built by BAE Systems, recently installed at a test facility in Dahlgren, Va. The test shot kicks off a month-long series of full-energy tests to evaluate the first of two industry-built launchers that will help bring the Navy a step closer to producing a next-generation, long-range weapon for surface ships. The Electromagnetic Railgun Innovative Naval Prototype (INP) was initiated in 2005. The Phase I goal of 32 mega-joule muzzle energy proof-of-concept demonstration has been achieved. A future weapon system at this energy level would be capable of launching a 100-nautical mile projectile. This launch energy has the advantage of being able to stress many components to evaluate full-scale mechanical and electromagnetic forces. Phase I was focused on the development of launcher technology with adequate service life, development of reliable pulsed power technology and component risk reduction for the projectile. Phase II, which started in 2012, will advance the technology for transition to an acquisition program. Phase II technology efforts will concentrate on demonstrating a 10-rounds-per-minute firing rate. Thermal management techniques required for sustained firing rates will be developed for both the launcher system and the pulsed power system. The railgun is a true warfighter game-changer. Wide-area coverage, exceptionally quick response and very deep magazines will extend the reach and lethality of ships armed with this technology. Officials from the Office of Naval Research, BAE Systems and General Atomics has invited the media to the teleconference to discuss the series of tests on the BAE Systems-built EM Railgun prototype launcher and to evaluate rail life and structural integrity of the system. The firing at Naval Surface Warfare Center Dahlgren Division (NSWCDD) kicks off a two- month-long test series by the Office of Naval Research (ONR) to evaluate the first of two industry-built launchers. The tests will bring the Navy closer to a new naval gun system capable of extended ranges against surface, air and ground targets. The 32-megajoule prototype demonstrator, built by BAE Systems, arrived at NSWCDD on Jan. 30. One megajoule of energy is equivalent to a 1-ton car being thrust at 100 mph. The prototype—which now looks more like a naval weapon compared to previous lab-style launchers—is the first of two industry-built launchers to be delivered to the Navy. General Atomics is building the second launcher, scheduled for delivery in April. ONR previously relied upon laboratory-built systems to advance the technology. MIT News: MIT Researchers Find Critical Speed Above Which Birds And Drones Are Sure to Crash.